Don’t Judge a Cowboy… by the color of his whip! A while back, I was browsing some other whip websites and I happened across the statement that said that no “real cowboy/cowgirl” would dare carry a whip on their saddle that was any other color than black, tan, or brown. I thought I’d interact with that idea for a bit and demonstrate that, apart from being untrue, a case could be a made that “real” cowboys and cowgirls might actually be better off in some cases with a whip that was made in colors other than black, tan, and brown. Through my whipmaking adventures, I’ve noted that there’s actually quite a bit of diversity among the cowboys and cowgirls of America. They come in all sizes, shapes, and colors and so do the horses, equipment, and tack that they use. Whips are no different. Suggesting that a “real cowboy” won’t use whips that are only certain colors is just as silly as saying cowboys won’t drive Dodge trucks, wear yellow shirts, eat Krystal burgers, or ride an American Paint Horse. 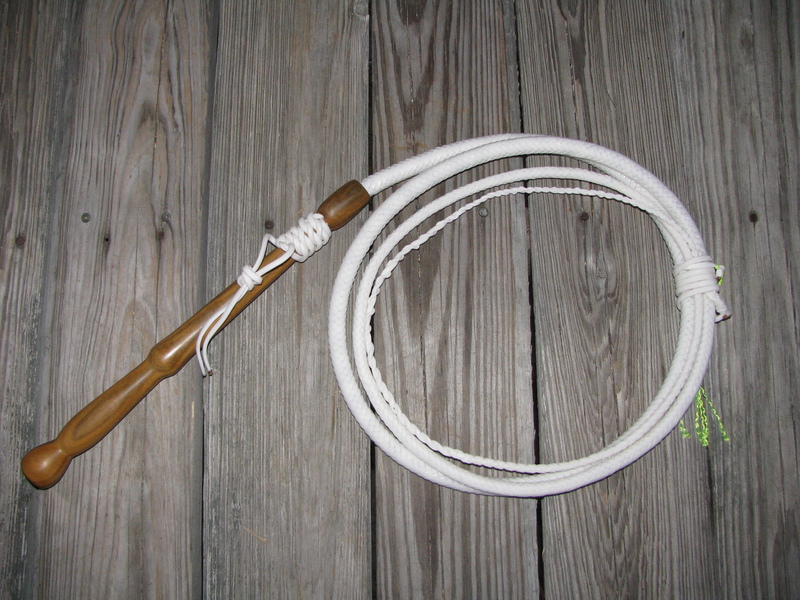 One big reason why a “real cowboy” might consider ordering a whip in colors other than black, tan, and brown is because whips get lost. About a decade ago, I had a “real” Florida cowboy call and order a solid hot pink whip. His old whip had fallen off his saddle and he wasn’t able to find it. He said he knew he would get laughed at by some of his peers, but he wanted his whip easy to see if it happened to fall off his saddle again. Indeed, I could probably take my wife out to a nice dinner if I had a dollar for every story cowboys have told me about losing whips while working cows. The earth tone whips often blend in so well that they cannot find them if they backtrack searching. Having a whip that won’t blend in can help with that problem. 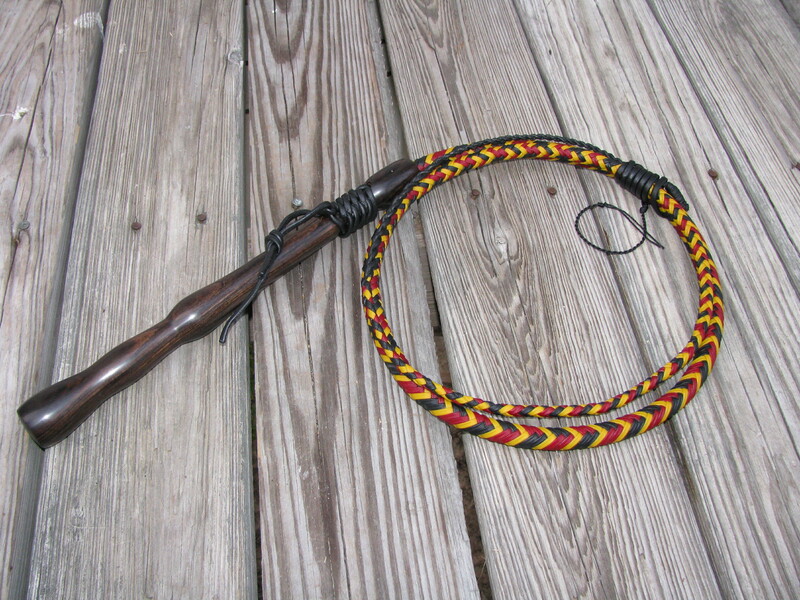 So in reality, real cowboys ought to seriously consider buying whips with lots of bright colors. 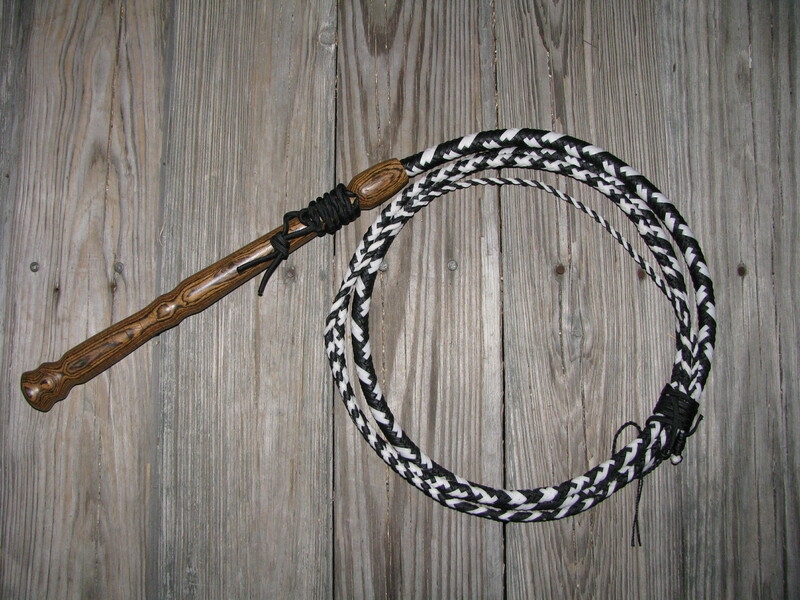 So while I’ll grant that lots of working cowboys do order whips in earth tones, I’m also happy to cater to the ones who want them in other colors and patterns. I’d also like for the reader to note that all the whips pictured in on this post are examples of whips I’ve made for “real cowboys” who derive most (or all) of their income from working with cattle. 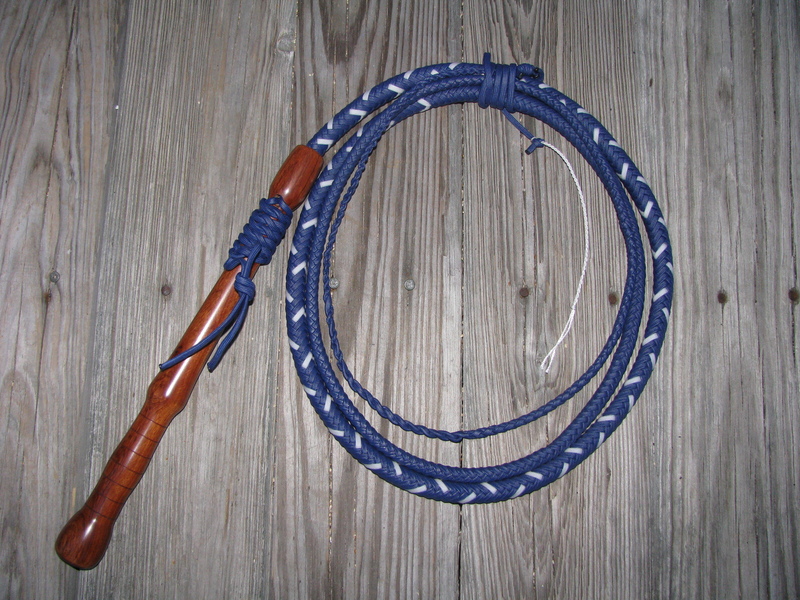 Visit my online photo gallery for more examples of whips I’ve made. Stop by the store to buy one! Others may judge you by the color of the whip you order, but I won’t. This entry was posted on Saturday, March 23rd, 2013 at 1:27 pm	and tagged with bullwhips, Cow Whips, cowboys, cowgirls, whip, whip maker, whipmaker, whipmakers, working cowboys and posted in bullwhips, Cow Whips, cowboy gear, nylon whips, Rants, Uncategorized, whip makers, whipmaking, Whips. You can follow any responses to this entry through the RSS 2.0 feed.